Fairfield Inn Approved along Meridian Blvd. A New Jersey development company can move forward with plans to build a hotel in Spring Township’s Spring Ridge Development, township supervisors decided Monday. 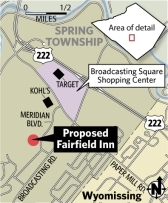 The supervisors unanimously voted to allow AVA Development Co. of Parsippany to build a three-story, 111-room Fairfield Inn & Suites on Meridian Boulevard. Spring Ridge is a 576-acre planned residential development that originally called for office uses but not hotels. AVA plans to buy 4.5 undeveloped acres from BPG Properties of Philadelphia. AVA principal A.J. Patel said last month that Spring Ridge was an attractive location due to its proximity to Route 222 and businesses. Local tourism officials are happy about a new hotel coming in, saying the county’s 2,524 hotel rooms are inadequate during the summer months. “Then the overflow goes to neighboring counties,” said Lisa Haggerty, marketing manager for the Greater Reading Convention & Visitors Bureau. As of November, Berks’ 31 reporting hotels had an average 54.2 percent occupancy year to date. While that rate is up almost 5 percent from the previous year, it’s below the statewide average of 63.1 percent for the same time period. At a hearing on the hotel plans last month, two members of the Spring Ridge homeowners association said they supported the proposal. “They’ve been working with us through it all to address our concerns,” James Dreibelbis said of developers. Donna Beissel said neighbors were also pleased with plans to plant evergreens and other plants around the hotel. Patel said it would take a year to build the Fairfield Inn and he hopes to start the project by spring, pending receipt of the necessary plan approvals. He wouldn’t say how much AVA would spend building the hotel. Bryan joined NAI Keystone in July of 2004, prior to joining NAI, Bryan Cole spent 4 year’s active duty in the U.S. Marine Corp, including a 6 month deployment in Afghanistan, a 4 month deployment in Kuwait/Iraq, and a 7 month deployment in Japan. Prior to joining the military Bryan was involved in the construction of commercial and multi-unit properties in the Philadelphia suburbs. Bryan has experience working with a diverse group of individuals in numerous countries throughout the world. During Bryan’s time at NAI, he has sold and leased in the excess of $280 Million Dollar’s worth of Commercial Real Estate. Because of this, Bryan earned NAI gold club status his first year in the business. Bryan is currently working on earning both his CCIM designation and SIOR designation. Bryan has been the Top Performer/Producer at NAI since 2006 with an average of $30-$35 Million in production annually., and over $64 Million in 2012. Bryan has concentrated his efforts on medical/office property along with Big Box industrial. This entry was posted in Deals and Highlights, Reading Eagle News and tagged AVA Development Co., BPG Properties, Bryan Cole, Fairfield Inn, John Buccinno, NAI Keystone, Spring Twp. Hotel, Wyomissing Hotel. Bookmark the permalink.